The State Government of Goa issued a tender document on 03-Oct-2014 for a PPP concession to develop and operate a greenfield airport at Mopa, which will be the second airport in the state. Mopa is located approximately 35km north of the state capital, Panaji. The new airport will complement the existing facility at Dabolim, which will continue to operate after the Mopa airport opens, providing enhanced air connectivity to the state. Tourism is one of the largest industries in Goa, with the state attracting 2.63 million domestic and 492,000 international visitors in 2013. Ease of access is critical to achieving sustained growth in visitor numbers. However, there is also strong potential in outbound travel given that Goa has the highest per capita state domestic product in India. In FY2014 Goa Dabolim handled 4.0 million passengers, making it the ninth largest airport in India. Domestic passenger movements accounted for 82% of total traffic. Over the last decade Goa's domestic traffic grew at a compound annual growth rate (CAGR) of 16.5%, while international passenger movements increased at 10.2%. In the first five months of FY2015 total traffic is up a further 18.0% year-on-year, the highest growth rate amongst the ten largest airports in India. This strong growth has been achieved despite various operational constraints at the airport and without any concerted effort at airline marketing and route development. Inbound domestic and international tourist arrivals have grown at just 4.4% per annum over the last ten years according to the Goa Directorate of Tourism. This suggests that much of the growth in airport traffic is due to a combination of travel by residents of Goa, as well as modal substitution with a greater proportion of tourists that used to travel by road and rail now arriving by air as a result of the availability of lower fares. Sustained and rapid growth over the last decade pushed passenger traffic at Goa Dabolim well above its design capacity resulting in severe terminal congestion. A brand new integrated domestic and international terminal opened in Dec-2013 with enhanced capacity of just over 7 million passengers per annum (compared with the 4 million passenger movements handled in FY2014). This has considerably improved the passenger experience, although the quality of some of the construction is now coming under question. Despite the short-term relief that the upgrade offers, Goa’s long term tourism potential is likely to be compromised without a second airport. If the current airport maintains its recent growth rate of 15% per annum it could saturate within 5 years. There is limited land available for further expansion. Given the lead time required to develop a new airport (from securing regulatory approvals to dealing with potential legal challenges, awarding the concession to an operator, preparatory works and construction) the time is right to be proceeding with the greenfield tender. In addition, the current airport is sited adjacent to areas of cultural and environmental significance, which limits the potential for large-scale integrated tourism development close to the gateway. There is therefore an opportunity to make the airport at Mopa the catalyst for a Tourism Master Plan for New Goa which includes theme parks and leisure attractions; convention centres; theatres, cinemas and a cultural precinct; golf courses and sporting facilities; shopping malls, downtown duty free and outlet centres; and of course hotels and resorts. The ability to combine these modern attractions with Goa’s beaches, historic Portuguese architecture, and sites of religious significance would make Goa a unique destination and support the diversification of the state’s tourism base. Dabolim airport is operated by the state-owned Airports Authority of India (AAI) as a civil enclave within an airfield that is managed by the Indian Navy. Sharing infrastructure with a defence force imposes certain operating restrictions on commercial airline services. Due to military training exercises, commercial operations are prohibited between 8.30am and 1pm on week days. There are also occasional restrictions in the evening. This limits the availability of preferred slots for airlines and also results in heightened peaks in arcraft movements just after the curfew ends at 1pm for which capacity has to be provisioned and which then lies under-utilised for much of the rest of the day. 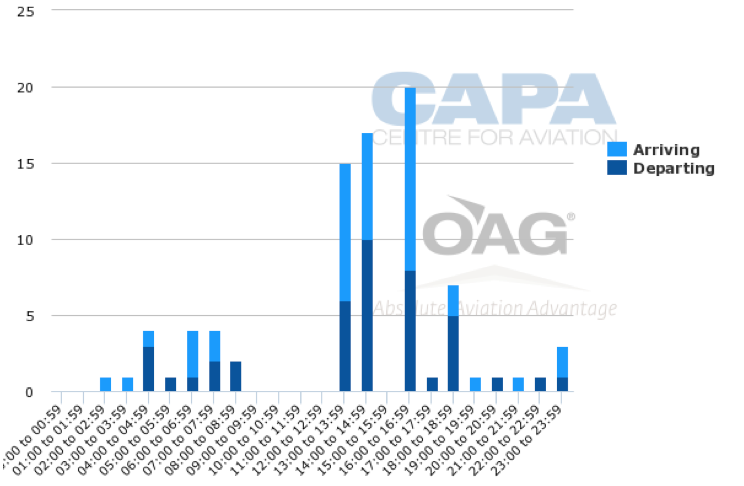 The airport has limited apron space and the absence of high speed exits for arriving aircraft results in high runway occupancy time, creating significant congestion during the peak period between November and January each year. Intenational traffic flows at the airport are highly seasonal with 48.0% of passengers handled in the three months between January and March, and 77.2% in the five months between November and March. Goa’s challenges are excacerbated by the fact that almost 50% of its domestic capacity is to Mumbai, the closest major gateway, which is itself a slot-constrained airport. However, given that Goa has a very limited network, many passengers have no option but to connect via Mumbai. This presents particular challenges for international travellers. The majority of international arrivals in Mumbai from the key Asian, European and Gulf hubs occur between 9pm and 5am. Passengers arriving between 9pm and 1am face a lengthy transit until the first and only morning bank of domestic services depart for Goa between 5am and 5.30am. Passengers arriving after 3am have insufficient time to connect and have to wait until the next bank of departures starting from 12 noon. On the return there are only limited evening services from Goa to Mumbai to connect with the main international departures. As a result, our research indicates that many foreign tour operators and conferences/incentives organisers have concluded that despite its many attractions, Goa is a difficult destination to sell on scheduled services because of the connectivity challenges. A 24 hour airport at Mopa will have the ability to attract a wider range of international services that may simply not be able to operate within the restrictions in place at Dabolim. According to Goa Department of Tourism statistics, foreign visitor arrivals to Goa have increased by just 4.6% per annum over the last ten years, compared with 9.6% at the all-India level. 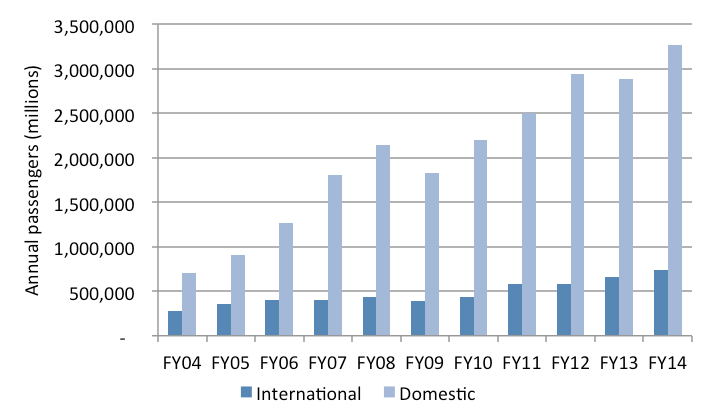 The modest growth rate is due in part to the limited international connectivity at the airport. The only year-round sheduled operations are to the Middle East and a large proportion of traffic on these services consists of expatriate labour rather than tourists. Air India has no feed beyond the Middle East, while Air Arabia operates a point-to-point model. Although a substantial proportion of its passengers self-connect, Air Arabia does not operate to any of the leading souce markets for Goa apart from Russia. Qatar Airways is the only carrier that currently connects Goa with a global network, however capacity is limited with just a daily narrow body service. In Nov-2014 Jet Airways will launch daily Goa-Abu Dhabi service with 737 equipment, feeding into its partner Etihad’s hub. One of the reasons for the limited year-round scheduled network is that tourist arrivals are highly concentrated from November to March due to the destination’s attraction as a winter sun destination for European tourists. During these months the international network is boosted by a number of seasonal charter and scheduled operations by European carriers, primarily from the UK, Germany, Russia and the Ukraine. Airlines that have operated seasonally to Goa include Aeroflot, Condor, Transaero, Thomson, Thomas Cook, Ukraine International Airlines and VIM. In FY2014 Goa airport received over 1100 international charter services, representing around 90% of the total charters operating to India. 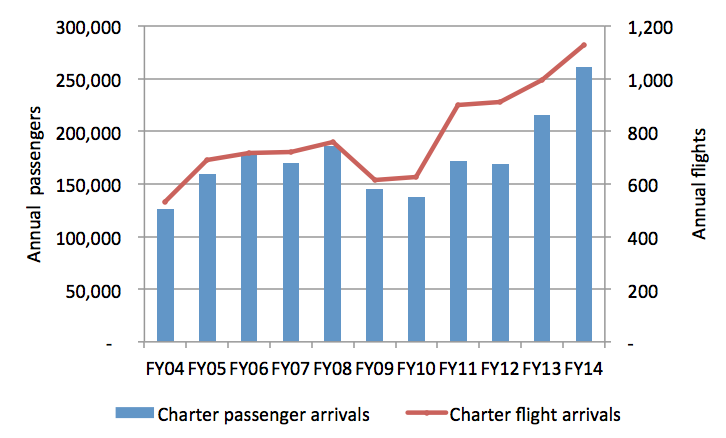 Charters accounted for a significant 70.8% of international passengers handled at Goa last year. However, with appropriate product development, identification of new markets and effective engagement with global airlines, there would appear to be potential to strengthen the network by encouraging increased year-round scheduled services. The airport operator could also consider opportunities to develop routes that faciliate dual centre holidays, linking with and leveraging the success of other destinations. A more diverse network will not only support tourism growth but will also reduce the risk of dependency on European markets. Russia is currently the largest source market and accounts for a third of total arrivals, followed by the UK. These two markets alone accounted for 63% of foreign visitors in 2013, while Europe as a whole represented more than 90% of total international arrivals. 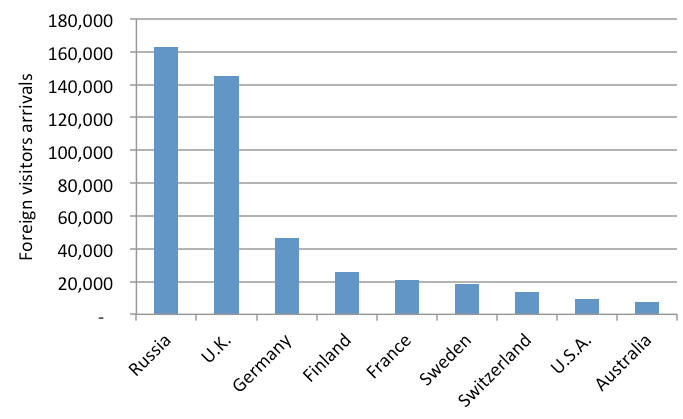 The eight largest source markets were all European, followed by the US and Australia. Asia is the fastest growing source region for tourism to India overall, as is the case for many destinations around the world. However, there is no international connectivity between Asia and Goa, and Asian tourists accounted for less than 2% of visitors to Goa in 2013. Unlike competing beach destinations such as Bali, the Maldives and Mauritius, Goa has failed to tap into the inexorable growth of outbound tourism from China. This represents massive upside potential if the airport and tourism operators are able to develop this opportunity. India is expected to liberalise its immigration requirements within the next six months by extending visa-on-arrival facilities to the citizens of most of its largest source markets (although Chinese nationals are not expected to be eligible for the visa-on-arrival programme). This has the potential to stimulate more spontaneous, short break holidays but such travel requires that visitors are able to fly directly to their destination. If Goa wishes to leverage this opportunity it must have a far more diverse network and attract a broader range of airlines. Hotel operators and developers appear to be optimistic about the tourism potential in Goa, despite the challenges. HVS research indicates that the supply of branded hotel rooms in the state is expected to increase by 50% over the next five years, the majority of which is already under active development. More than 70% of this capacity will be in the mid-market and budget categories which has implications for the category of airlines that should be targeted. Among the 13 major hotel markets in India, Goa had the second highest average occupancy rate in FY2014 at 70.2% (despite the seasonality of the market). The state’s hotels have also achieved the second highest CAGR in average room rates over the last decade. The proposed greenfield airport is not without its detractors. Mopa is located in the north of the state and hotels and tourism operators from the south believe that they will be at a competitive disadvantage due to their greater distance from the airport. The current airport, which is much more centrally located will however continue to operate, and will be the more convenient gateway to the south coast. Nevertheless, with Mopa being a PPP airport which will be more commercially aggressive than the AAI facility at Dabolim, and with the advantage of greater operational flexibility, the possibility exists that the current airport may have less network diversity than Mopa. Other objections to the new airport have been raised on environmental grounds. The airport’s Environmental Impact Assessment is yet to be completed and will need to be cleared before the concession is awarded. However, this is not expected to be a major hurdle. With the same party, the BJP, in government at both the state and centre, and elected on a pro-development and pro-tourism agenda, there is a confluence of political objectives that should enable clearances to be fast-tracked. Concerns have also been been raised that the new airport will lead to over-capacity, especially given that there are plans to construct another greenfield airport just across the state border in Maharashtra at Sindhudurg. However, this objection is perhaps reflective of the short-term perspective that has guided aviation development in India in the past. It does not take into account the faster traffic growth that could be achieved with commercially focused product development and marketing. There is huge potential to grow both domestic and international services and a state that is so highly dependent on tourism requires a master plan for airport capacity that looks ahead at least a generation and not just to the next five years. The Request for Qualification (RfQ) document outlines a four phase development of the new airport over the period through to 2036. Phase 1 is expected to be ready for operations by 2018 with capacity for 4.4 million passengers, with an estimated poject cost of INR15 billion (USD244 million). The successful bidder will also be allocated 381 acres of land adjacent to the airport which can be used for non-aero commercial development. The RfQ presents a forecast of 13.1 million passengers at Mopa by 2045. Combined with a capacity of approximately 7 million passengers at Dabolim, the dual airport system will handle just over 20 million passengers in a little over 30 years from now, assuming that it is not possible to expand the existing airport further. This represents a compound annual growth rate of around 5.2% which appears to be very conservative given that traffic growth at Goa has averaged 15.0% per annum over the last decade. 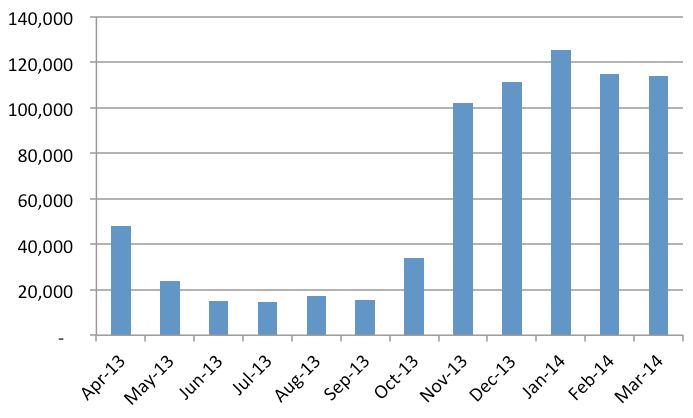 And this growth has been achieved in the absence of any marketing or route development by the airport operator. Goa has arguably not even scratched the surface of its tourism potential. There is significant growth that could be achieved by developing a wider range of international source markets. And, as disposable incomes in India rise, driving increased expenditure on leisure and travel, there would appear to be no reason why there should not be direct services from at least the 20 largest Indian cities to Goa. There are several reasons to be optimistic about the outlook for Goa: India’s GDP growth is expected to accelerate over the next 18 months; the Goa state economy is set to receive a boost from the renewal of mining leases; the entry of new carriers is likely to result in fares remaining competitive; and Prime Minister Modi has earmarked tourism as a priority sector for development. Even if traffic were to grow at 10% per annum – and that may prove to be conservative - both Dabolim and Mopa would saturate within a little over 15 years. Under such a scenario Goa would need to soon start planning for a third airport in the state. The operating restrictions faced by Goa are highly unusual amongst global destinations and place it at a disadvantage. A second airport operating 24x7 will be a serious demonstration of the state’s long term commitment to the tourism industry and economic development in Goa. Mopa has the potential to be the catalyst for large scale investment in a 20-30 year Tourism Master Plan with a vision of developing Goa as a leading global destination. Serious investment can only enter the sector if providers of capital and expertise are convinced that the long term air capacity exists to deliver tourists in the volume required to generate a return. 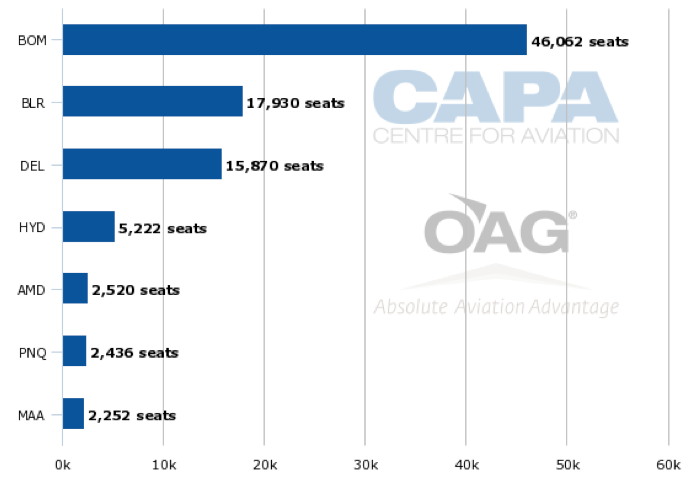 CAPA India is South Asia’s leading aviation advisory and research practice. We have the most exhaustive databases and intelligence on the Indian aviation market and can provide valuable support to parties interested in the Goa Mopa tender. Key services that CAPA India can provide include delivering industry briefings to your team; sourcing and analysing traffic, commercial and financial data; in-depth analysis on tourism trends; providing an in-depth assessment of current and expected bilateral seat entitlements; planning airline network scenarios for Goa; critical insights into the regulatory and policy settings in the Indian market; providing passenger and freight forecasting; detailed research on retail and non-aero opportunities; studies on real estate and land use in the Mopa district; insights into airspace issues in a multi-airport system in Goa; status of the ground handling sector; master planning and facility planning; and conducting risk assessments.